Just had to share this with you… As you know, I made a lot of my own handmade Christmas Presents this year, and one of the easiest ones I did were these cute little christmas tree chocolates! And just left them to set in the fridge for a few hours! 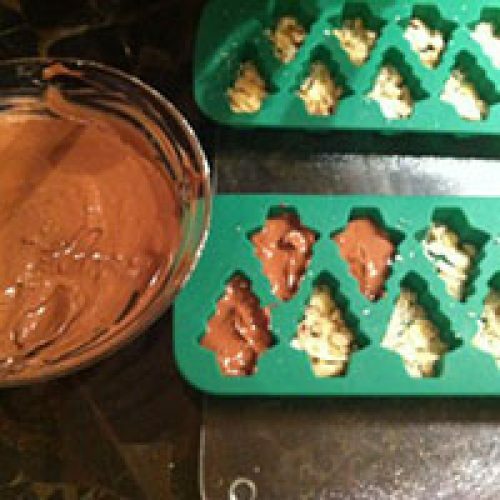 I feel like a bit of a fraud calling them home-made chocolates, when all I did was melt and re-form some chocolate with a few nuts in, but people felt like i’d made a real effort and were thrilled! And again, just wrapped up in a little cello bag with a bit of ribbon tied around the top, they did look kind of special! It’s a really quick and easy way of making everyone feel like you went to a lot of trouble, and I would highly recommend giving it a go!